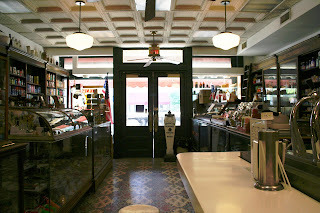 Established in 1926, the Hutchinson drug store is a great place to sip a malt or shake. Inside you will find mosaic tiled floors, metal ceilings, and antique glass cabinets filled with vintage apothecary equipment. And, incredible as it may seem, it is still a functioning drug store. 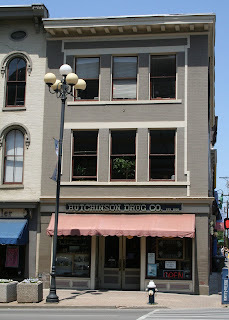 Hutchinson's is located at the corner of Broadway and Short in Lexington, Kentucky. This store has recently closed. When did this Store close and what has become of it? I am a Grandson of the man who established this Pharmacy Julian Hutchinson and although I have been there many times in my life, it has been several years since last I was there. What can you tell me of its more recent history? Who owns the building now and or who last owned it? My older brother, baby brother, mom, and I always used to go to Hutchinson's after school (we went to St. Peter and Paul grade school) when we lived in Lexington. I would get a vanilla ice cream and my older brother would get a peanut butter and jelly sandwich and sometimes a chocolate soda. It was a wonderful place and is forever embedded fondly in our memories. I found it to be magical, it is a staple of my childhood memories. The last time we were there was when we visited in 2006 it was the last time we saw it. We visited Kentucky again in 2012 and discovered it had closed, which was saddening. It'd be great to get information as to why it closed and hear more of its history. I'm glad other people remember it!